It’s gooey , it’s gross and it’s green! 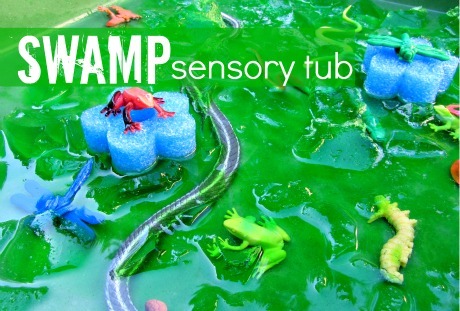 It’s a swamp and this sensory play idea was a huge hit with both my 5 year old and my toddler. It was surprisingly easy to make and a great way to spend some chill time outside. 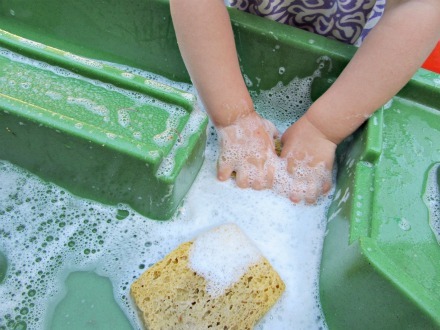 Sensory play is so much more than squishing things it’s about discovering with all your senses and pretend play as well. 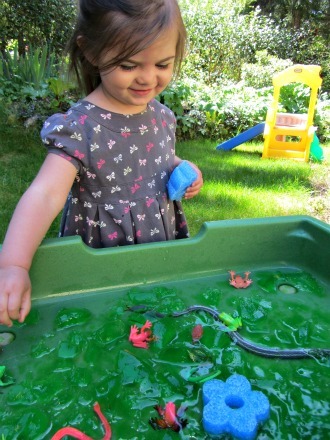 My kids spent a good about of time simply making sounds with the goo, sounds like glurp, goop, glug, squish , slip , slurp. It was fun to see how they both narrated their experience and the giggles were amazing too. Gather your materials. You will need some gelatin ( I used plain because I had it on hand and added kool-aid for color but plain jello without the sugar should work too). 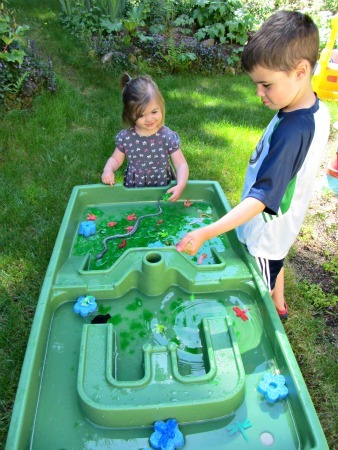 You will also need a large container, pool noodle, some plastic swamp creatures, water and a large tub or water table to play in. My daughter helped me make the gelatin. I followed the directions on the back for fruit jellies doubling the recipe. 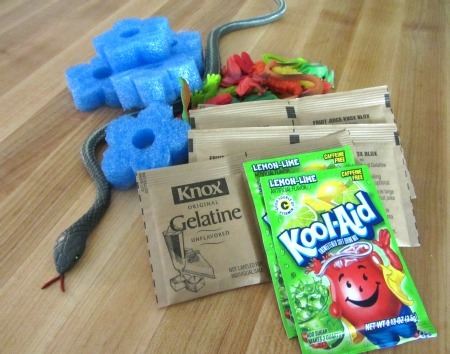 I love that by using kool-aid the gelatin smells awesome and is so tart even if kids do taste it , they spit it out. Also I used this old animal cracker container because it was a perfect fit for a space I had in my fridge. And it had a lid which was important since it was at kid level too. We let the gelatin set overnight in the fridge even though ours was ready to go in about 3 hours. 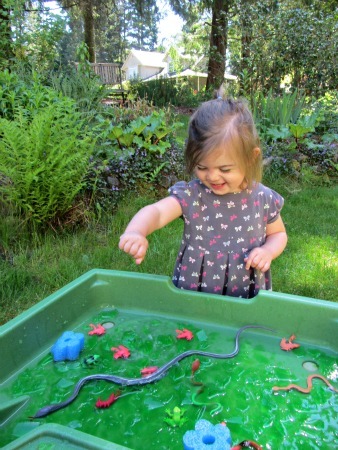 We cleaned the water table ( it had dirt and rocks in it from our last play adventure) – this was an activity all on it’s own. 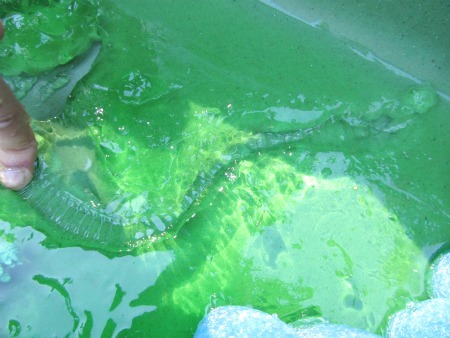 Then the next morning after the gelatin was nice and set I filled one side with the gelatin and the other with water – added sliced pieces of pool noodle for lily pads and just enough creatures to invite play. My son loved flopping the gelatin into the water side and it was neat to see how it would sink to the bottom. My daughter loved squishing and squishing and squishing . I just kept taking pictures and soaking up the giggles. Did I mention it smelled amazing too, much better than a real swamp. 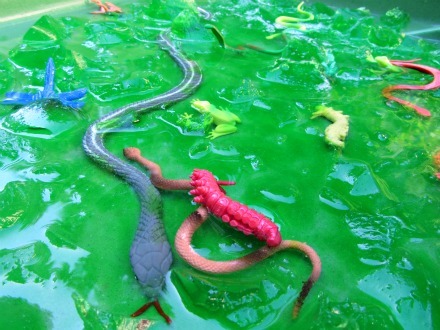 In the afternoon the sun melted the gelatin and my kids were bummed but we covered it and sure enough the next morning it was all congealed again and they had an absolute blast pulling the creatures out of the goo, and we noticed the imprints they made too. We’ll see how many days we can keep it going! This looks absolutely awesome! My boys would love it! I’ll have to share it in my link ups this weekend. Thanks for sharing a great idea! Oh, this is so cool. Pleased to see your big kid liked it too, I know my 5 years olds will squeal with delight! This is awesome. I am pinning this one! This is fantastic. I think I would play with this just as much as my daughter! 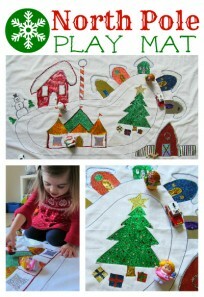 I’d love it if you’d link up to my Teaching Time for Toddlers post! I love this! I don’t have gelatin but you just gave me an idea I could improvise. I think I’ll take my toddler’s old bathtub out to our patio and fill it with water and sponges. He’ll totally love that today since it’s so hot! I love this! 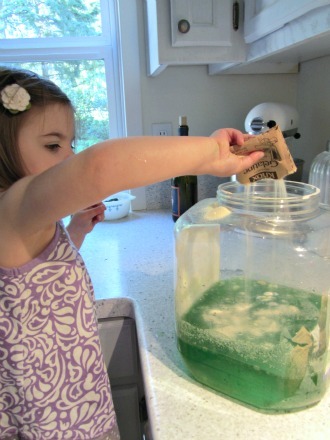 Jello is one of our favorite sensory materials. I love this! I am going to do a pond theme soon and this is perfect! Thank again for the inspiration. 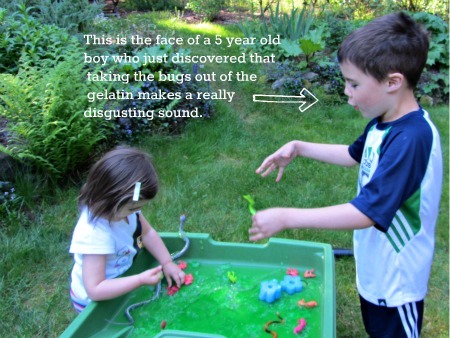 want to be clear…did you chill the gelatin/kool-aid mixture overnight? I did and because you asked that let me go make it more clear in the post. However since putting it into our water table it melts every afternoon and re-congeals by morning. Albeit we are in the Seattle area and it gets cool at night still. I think tomorrow will be it’s last day though it’s getting a little ew. This has to be one of my favorite sensory tubs posted yet! So cool. I will have to try this for my kiddos. Hey, I have a couple questions. This is a great idea but mine didn’t turn out like yours. Can you plz give me the exact recipe for the mixture you made? My gelatin packets did not have a recipe for ‘fruit jellies’ on them so I guess I didn’t do it right. Do I need to add juice or what ingredients to the mixture? Also, how did you cut the pool noodles to look like flowers? Was it a big or small pool noodle? I would appreciate any details of the instructions you can give. Thanks so much!! This is the recipe : Sprinkle 2 packets of unflavored gelatine over 1 cup (250 mL) cold water( I added koolaid in cold ) ; let stand 1 minute. Add 3 cups (750 mL) water , heated to boiling and stir until gelatine is completely dissolved, about 5 minutes. Sweeten to taste, then chill and serve as above. We did this today 🙂 The kids really enjoyed it – thanks for sharing. Wish I had noticed you posted the recipe before now – but it worked out 🙂 Even my ten-year-old had a lot of fun. So happy it worked and that’s rad that even your ten your old was into it! Yes – jelly is gelatin right? I think it will absolutely work! I will double check with a friend who is from the UK and edit if it’s not. My daughter is a sensitive child like I was so I want the texture only. The jelly wasn’t very sticky at all because no sugar was added. OMG I love this I’m going to pin it to my summer list. Thanks for the great idea. Goodness this is late, pool noodles are the long foam floats you find at pools and Koolaid is a powdered drink mix with great artificial colors and flavors… not sure you can call it food though. 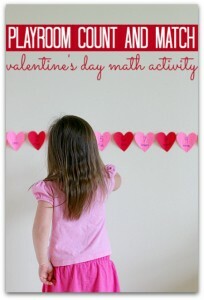 I love this idea and will definitely be trying this with my Prekindergarten class next week! If you don’t mind me asking, where did you get that sensory table? I love it! I want to do this for my 3 yr old granddaughters birthday party but my daughter thinks it will be too messy for a party. Does the green in the kool aid stain the kids hands or clothes, and how easy is it to clean up. Does it totally dissolve or leave something funky in the grass. Thank you for your help. It didn’t stain our hands or clothes at all, it’s just regular jello – but we wiped them immediately after playing which is easier with two kids vs. a party. It will leave something funky in the grass if it’s hot out for sure. I threw the bulk of the goo away ( into our yard waste bin actually) and then let the kids help me clean it. Question: Could this be made into a sensory bag? I teach one year olds. 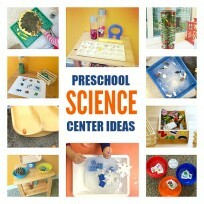 I dont really have a sensory table but love this idea.